Long before Rare got ahold of him, Donkey Kong starred in an arcade classic. 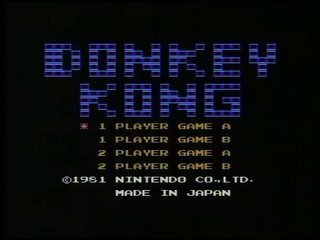 Donkey Kong was Nintendo's first big hit, and it was the first project by some guy called Miyamoto who would later do something or another. Console versions usually had to cut out one of the four stages because of memory limitations. They still sold really well though, don't worry. Best time: 0:01:03 by 'Pokey' on 2011-04-28. This run seems easy but trust me, it isn't. It seems like the barrel rarely goes down the ladder in floor 1, floor 2 takes some practice, and floor 3 is absolute hell.